Inland Northwest Curling came out of the desire to bring Lilac City and CDA Curling Clubs together to build a dedicated curling facility in the Spokane, WA and Coeur d’ Alene, ID area. Until we are able to install dedicated ice we curl at Frontier Ice Arena. The idea for the Lilac City Curling Club was germinated during the 2010 Winter Olympics by some officemates who discovered they shared an interest in this strange but fascinating game. None of them had every tried the sport (but one of them did own Men with Brooms), but that didn’t stop them from asking around about local opportunities. Sadly, they hit nothing but dead ends and seemed to have nothing to show for it but a page on Facebook. Fast forward to the summer of 2011, when an email inquiry sparked a resurgence of interest and a glimmer of hope. By January the club had been provided a fundraiser by C.I. Shenanigan’s (and remain eternally grateful) and just 2 months later hosted their first open ice event courtesy of Eagle’s Ice Arena. At that event, club members got to try their hand at the game, most for the very first time. More importantly the new club was introduced to some very fine gentlemen who were once active in the original Spokane Curling Club, which dissolved in the early ‘80’s after decades of successful curling. It turns out that these fine gentlemen knew where there were some stones and other equipment; equipment the new club couldn’t afford. These fine gentlemen very kindly donated their old gear to the new club, thereby passing on the torch of curling in Spokane. It started with a group of North Idaho teachers discussing the Olympic Games. The next thing you know there are six grown men sliding around on the nearby frozen lake, throwing spaghetti pots full of concrete at circles they had spray painted onto the ice (the verdict is still out on whether there were adult beverages involved). Within a year they had contacted the Creston Curling Club just across the boarder from Bonners Ferry. Some of Creston’s club members invited the new American “curlers” up to Canada for some real ice time and a few pointers (Thanks Vern Ronmark, Terry O’Conner and many more). The guys also found out about the Butterfly Bonspiel, an annual curling tournament held in Creston and starting making the trip up each year to compete. We will not disclose the running record of American teams at the Butterfly, we will just say those Canadians know how to curl! Years went by and the group of friends continued to curl about once a year until the fall of 2012 when the Lilac City Curling Club opened its doors with their first annual curling league in decades. The North Idahoans jumped on the opportunity to curl in an actual league for the first time. By the end of the fall and winter leagues in Spokane the Idaho group had made some good friends. They discussed the opportunity to kick start a Coeur D’Alene league with some help from their new curling associates from Washington. The Lilac City Curling club very graciously agreed to assist with the league, by lending A LOT of equipment and spreading the word around the area. Thank you Lilac City Curling!!! The last piece of the puzzle was ice. Thanks to Frontier Ice Arena and Vince Hughes there was an outstanding indoor facility to curl in. 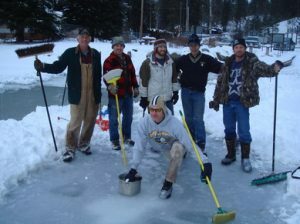 The next thing you know the ice is being painted, free learn to curls are scheduled, a league is getting ready to start up, and the 1st Annual Panhandle Bonspiel is on the calendar at the end of April. It has been a long road to get to where we are, and there still is a lot of work to do, but with the help of some amazing people we have met along the way the Coeur D’Alene Curling Club is sure to be a great success and fun for all!! !